Scene setting: For A/W 2017, Sarah Burton harked back to the paganism of Celtic England, erecting a series of hanging silk tapestries on the catwalk, in a cacophony of blues and oranges. The colours resembled flaming medieval pyres burning into the night sky and before the show began, Burton’s team lined the runway and hoisted the hangings, like rows of flying flags or sails on a ship embarking on an Arthurian adventure. Burton took particular influence from ancient creative communities in Cornwall, and her coastal preoccupation was echoed in a show soundtrack that started and finished with the sound of rushing water, with models walking on a shimmering blue gravel catwalk, that crunched like sand underfoot. Mood board: Burton took inspiration from ancient pilgrimages, including the concept behind ‘cloutie trees’, where trees next to wells are tied with strips of coloured fabrics as a form of votive offering to nature. 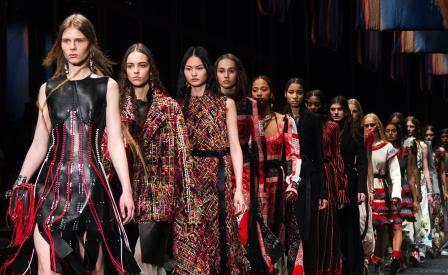 This image was echoed in knitted dresses and leather coats interlaced with flowing threads, chunky and colourful tweeds with raw edges and large clutch bags with rows of eyelets, tied with trailing threads in blue, white, pink and red. Best in show: Images from pagan rituals were also presented alongside those from more domestic traditions, like a series of raw hemmed dresses and asymmetric tops embroidered with colourful cross-stitching, inspired by 16th and 17th century needlework.